Today my dad would have been sixty-three years old. He died seven and a half years ago unexpectedly (what I hope will prove to be the suckiest thing to happen in my life). Allen Williford had a birthday three days after Christmas. I think most everyone knows someone with a near-Christmas birthday. He wasn’t a showy guy and the only way I knew he didn’t like “combo-presents” and such is because my mom told me. He was such a great person – the kind of person who should have had a birthday in the middle of nowhere on the calendar so that he could be showered with birthday-only affection and acknowledgments. So, today, I just want to take a moment and tell the greatest dad in my world Happy Birthday and then also just a little shake of my fist in the universe’s general direction because I don’t get to tell him in person. My dad, Tom, my mom, my sister, and I were all having lunch a little restaurant near my house (they had come down to Georgia to visit.) Out of nowhere, this kid (maybe about eighteen years old) comes up to my Dad and asks him if he knows how to tie a tie (he had one draped around his neck, pathetically waiting for a wise man to help out), and if so, would he tie his. My dad said, “I’ll do you one better, I’ll teach you how to tie a tie.” And so, my dad taught this complete stranger how to tie a tie in the middle of a restaurant. So Happy Birthday to my dad, who once taught a kid to tie a tie during lunchtime at a restaurant. 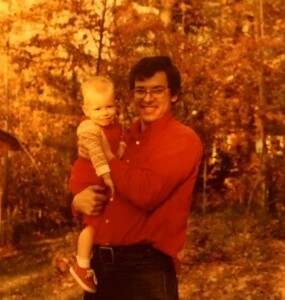 1978 – Me and my bald self with my dad. I bet that kid remembers the story every time he puts on a tie too. Happy Birthday Mr. Williford, and thank you for giving us your wonderful daughter’s company! That makes me so happy to think that kid might remember my dad. Awesome. Thanks Abby, that’ll teach the universe. Happy birthday to your dad!! He sounds like he was a truly spectaclar man and a really great dad. So sorry that the crappy universe took him from you so early. Damn universe! What a great memory to have of how capable and helpful he was to those around him. Thanks Misty, and thank you again for the awesome note and stuff you sent me! Happy birthday to your dad. This is a wonderful story. Thank you! I’m so glad Tom brought it up the other day. I had really forgotten about it. Ahhh, what a great dad. What a nice tribute to him on his birthday! I love this story – little acts that so illuminate what a person is really all about. Happy Birthday Carrie’s dad, wish you were with us still. What a wonderful story, thanks for sharing, and Happy Birthday to your dad. This is great. My dad just turned 63 and I’m lucky as hell to have him. Thank for reminding me of that. Welcome back. You were missed. Happy Birthday to your dad. Thanks, Lance. It’s good to be back. I only met your dad a few times I guess, now that I stop and think about it. Your dad had a special quality that put you immediately at ease and he never felt like a stranger so I guess I feel like I saw more of him than I really did. He was a very easy person to be around. I remember when your parents offered to donate their old kitchen cabinets to us and he spent quite a while helping me sketch out possible orientations and measurements, like it was no trouble and all and there was nothing he’d rather be doing. Happy Birthday to an exceptional person. Thanks, Hannah. I love hearing memories of my dad that I’ve either never heard before or don’t remember.